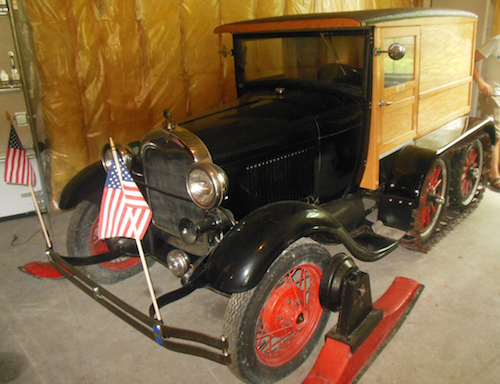 Rod searched and searched the internet looking for the ideal Model A that had already been converted to a ‘snowmobile’ that he could adapt to a ‘sandmobile’ and came across one in Maine in the USA. He explains: “As it turned out I had seen pictures of the car as a ‘snowmobile’ before it had a body put on it. I bought the vehicle from a dealer in Maine and as time passed getting the deal finalised, I came across a video of the very car running around in the snow but by now it had a fantastic van style body on it. “On arrival at my workshop here in Australia, I removed the van body because it was far too good to do what I intend to do because it would have become a giant oven driving the ’29 Model A Ford across Australia through 4wd terrain and stifling heat that can reach the low 50cs. “Unfortunately because the ’29 had been a snow runner there was rust galore and there were just so many parts that were not as good as they needed to be for what I was intending so I decided to do a complete strip down and a rebuild.